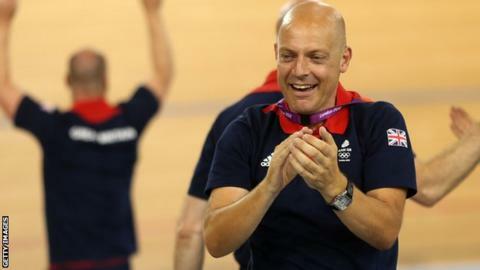 Sir Dave Brailsford sees the World Track Championships as a chance for new British talent to break through. Britain's squad for this week's event in Minsk contains several new names in the absence of Olympians Sir Chris Hoy and Victoria Pendleton. "There is a changing of the guard if you like," said Brailsford. "Young, aspiring riders have their opportunity to become the leaders of the team. That's what we are seeing in Becky James' case and in other areas." It is the first major track meeting since Britain won seven gold medals in the velodrome at London 2012. Welsh rider James, forced to miss the Olympics through injury and illness, competes in the women's sprint alongside Vicky Williamson, one of the squad's six newcomers. Another Welsh competitor, Elinor Barker, teams up with Laura Trott and Dani King for the pursuit, which the latter pair won at London 2012 alongside Jo Rowsell. With Rowsell concentrating on road racing for now, Barker, Trott and King have the chance to emulate their success at the Team World Cup last November. With Hoy set to bow out after the 2014 Commonwealth Games and Pendleton retired, Brailsford considers the World Championships, which are live on the BBC and run from 20-24 February, the ideal place to try new combinations at the start of a new Olympic cycle. "The Worlds is always where you start to see this blend of youth and more experienced riders coming together and that's always exciting to see. "The time after the Olympic Games is a time to experiment and try new things. In many respects, mix it up a little in terms of training and what riders are focusing on. I think it keeps an interest, it makes a difference and it makes a dynamic." Meanwhile, Jason Kenny is keen to improve his gold medal tally at the World Track Championships. But he has only won once at the Worlds, promoted from second in 2011, after France's Gregory Bauge was handed a back-dated ban for missing a drugs test. "It's been really frustrating," said Kenny, 24. "I've got so many silvers at home it's not even funny any more." Despite Britain's seven golds at the London Olympics, former riders Rob Hayles and Chris Boardman have warned against expecting a similar medal haul from the event in Minsk. However, Kenny, who has won three silvers and two bronzes at the Worlds, admits the Championships were dominating his thoughts with the 2016 Rio Olympics still three years away. "The World Championships are really important to me," he told BBC Sport. "I really want to win them. "I want to win as much as possible between now and Rio, and the most important race to me is at the Worlds. "The Olympics is the biggest event we can do, but the World Championships is a fairly close second. Everyone wants to win it and it's going to be as competitive as ever." Bauge, who was beaten by Kenny in both the individual and team sprint at last year's Olympics, will not be in Minsk to defend his title. The 28-year-old asked not to be considered for selection and says he is not physically fit or psychologically ready to return to competition, and insists his focus now is on Rio, not on gaining more world crowns. Read more on World Track Cycling 2013: Route to Rio or medals in Minsk?